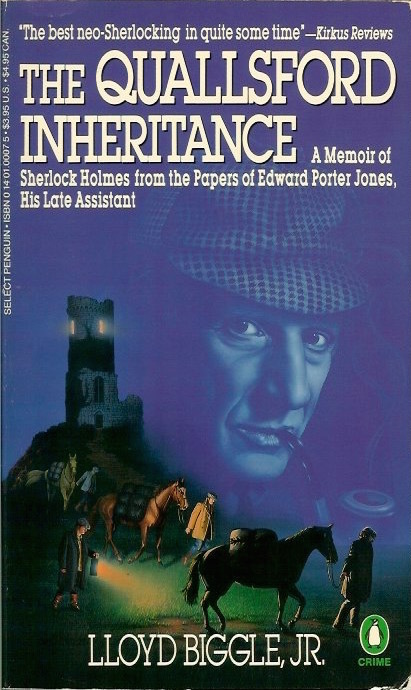 The Quallsford Inheritance – "a memoir of Sherlock Holmes from the papers of Edward Porter Jones, his late assistant" – was first published in hardcover in 1986. This is the first paperback edition. SHERLOCK HOLMES SAID, "IF YOU WANT TO KNOW WHAT HAPPENED IN EDMUND QUALLSFORD'S BEDROOM, YOU WILL HAVE TO FIND THE FIRST PAGE OF THIS LETTER...."
And so Porter, Sherlock Holmes's nineteen-year-old apprentice, sets off for the Isle of Graesney, where Edmund Quallsford has committed suicide. Or has he? Evidence seems to point to murder, and rumors of smuggling and old family debts prove to be well founded. Luckily, Holmes shows up–in disguise, of course–and the Holmes-Poter team sorts its way through a lively group of locals to find the smuggling-ring mastermind.